The new prime minister of Spain Mariano Rajoy reduced 15 ministries to 13 last week by merging culture and education with sports, and entirely eliminating science. It’s difficult to imagine a Spain without a Ministry of Culture. This of course is an austerity cut to salvage the Spanish economy. The new minister of culture, education and sports, Jose Ignacio Wert has stated “We will have to do more with less. There will be less culture of the subvention… One of our first priorities will be to develop the patronage law” has quoted by the newspaper El Mundo. So it appears that if culture is to continue to proser in Spain it will largely be through private sponsorship. 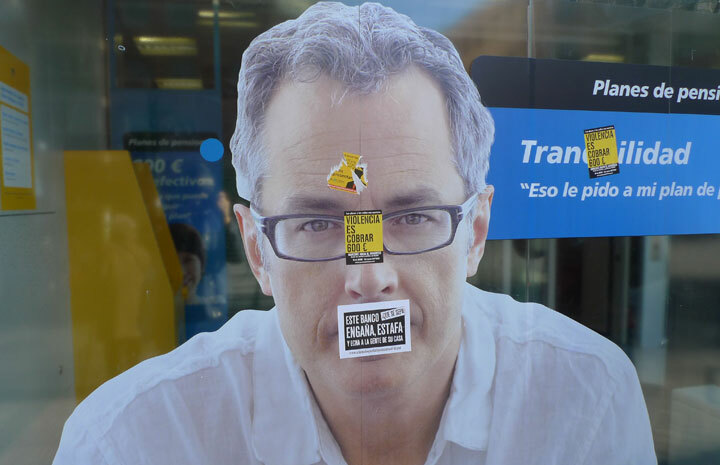 The incoming rightist party PP will in general seek to privatize, cut social spending and allow the markets to prosper… Once again, Friedman’s formula for a neoliberal economy will be the solution to Spain’s economic problems. Following the collapse of the Lehman Brothers, irresponsibility of banks and the recent economic collapse, I simply can not understand this. I can understand Spaniards being frustrated by the previous prime minister and the Socialist party’s inability to make economic reform, but to elect a strongly neoliberal party in its place? Who is the vandal - the bank or those effected by predatory bank loans? 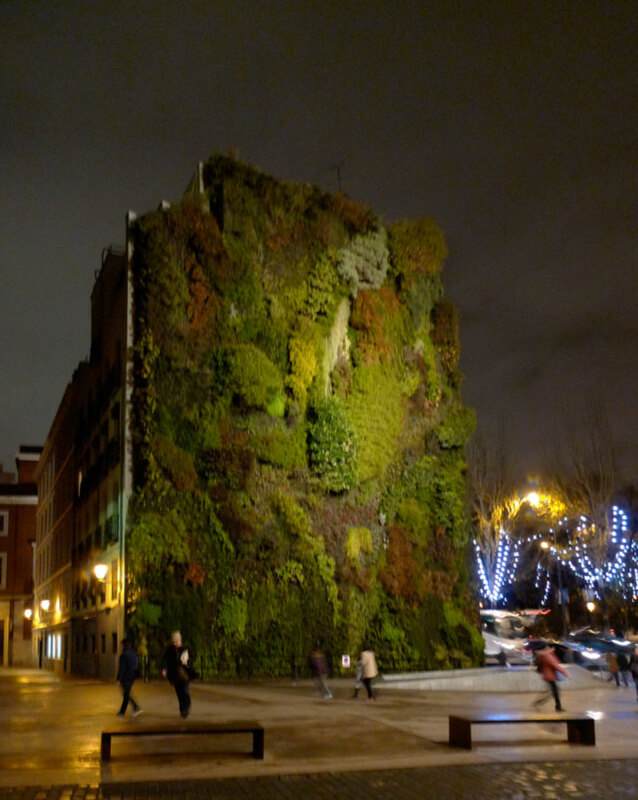 Meanwhile, “la Caixa” funds the magnificent CaixaForum Madrid the architecturally amazing cultural and social center that reflects the bank’s social cause. It’s entirely free to visit and features the vertical garden below on the facade of an apartment building across from its entrance. The complexities of the capitalist economy… does this beautiful and “free” cultural center make up for the injustice felt by many thousands who are experiencing economic hardship? 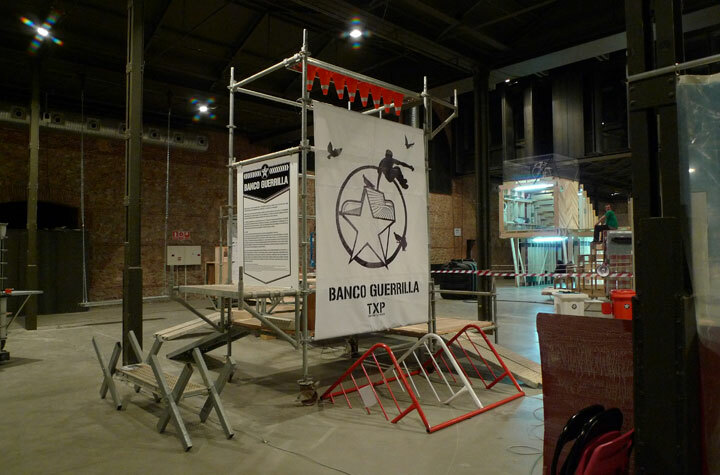 What will happen to edgy cultural centers such as El Matadero that is currently publicly funded, when private money is its only lifeline? Currently the feature exhibitions at CaixaForum are “Delacroix (1798-1863) and “The Persistence of Geometry” featuring a long list of well established artists such as Bruce Nauman, Donald Judd, Dan Graham, Richard Long, Gordon Matta-Clark, Mario Merz, Robert Smithson… Whereas El Ranchito, the latest program at Matadero Madrid focuses on work by young artists with a social agenda. 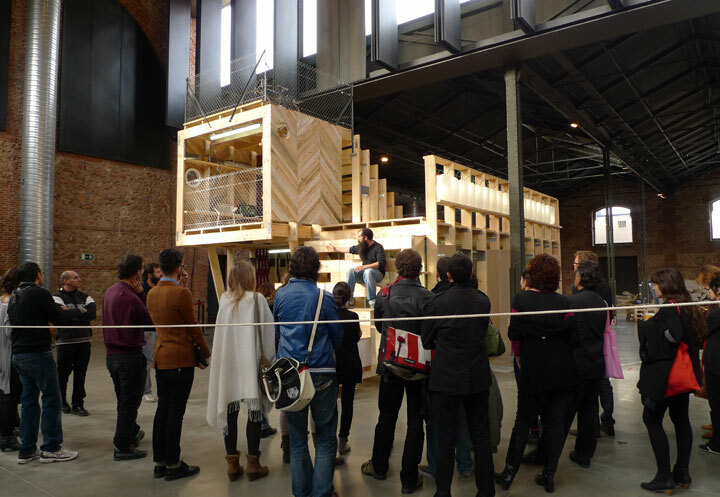 Would CaixaForum ever feature the art of a young large collective Todo por la praxis? Or the very difficult work of Sally and Gabriela Gutiérrez Dewar who have worked with squatters to realize their work at El Ranchito? Or will art work presented at Spanish cultural centers be reduced to safely historicized pieces that exist in the collections of the bank and its board members? 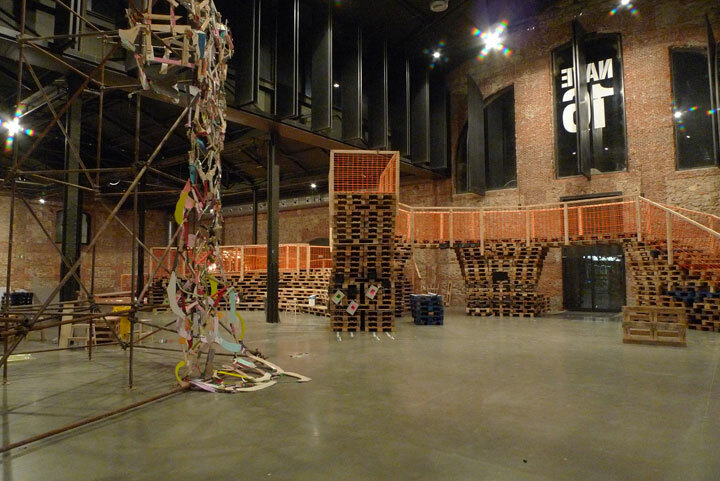 The art center, El Matadero in Madrid, Spain inaugurated its latest project – El Ranchito last Thursday, December 15, 2011. 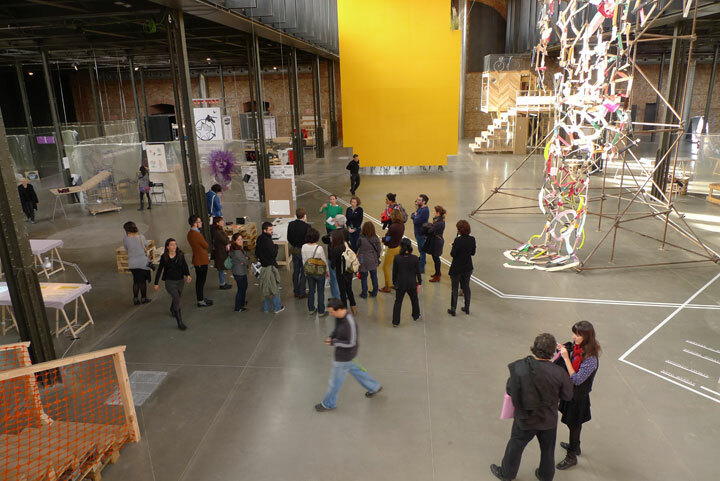 El Matadero is dedicated to contemporary art practices and El Ranchito is a gigantic space (Nave 16) within El Matadero that is dedicated to artistic research, process and social engagement. Brooke and I collaborated with two artists in Madrid to begin a long-term project titled EXCEDENTES/EXCESS that revolves around food waste in our cities. Below are images from the final night of preparation for the opening and photos from the media tour on the morning of the opening as well as an image from the opening. 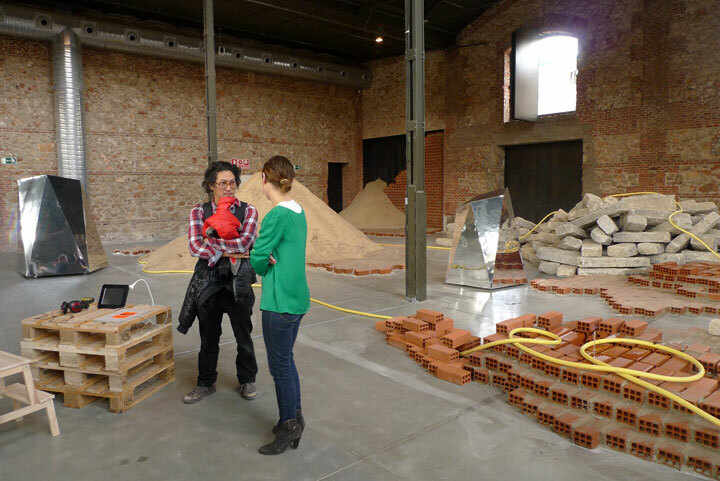 André Komatsu employed largely discarded construction materials around El Matadero to create “Landscapeknowhere – Timeout”. I enjoyed getting to now André Komatsu, however, I found his installation to be very formal, not particularly interesting and not in line with the mission of El Ranchito – research oriented and engaged with social practice. Inteligencia Colectiva bases its practice in traveling the world to discover, document and adopt alternative means of construction. 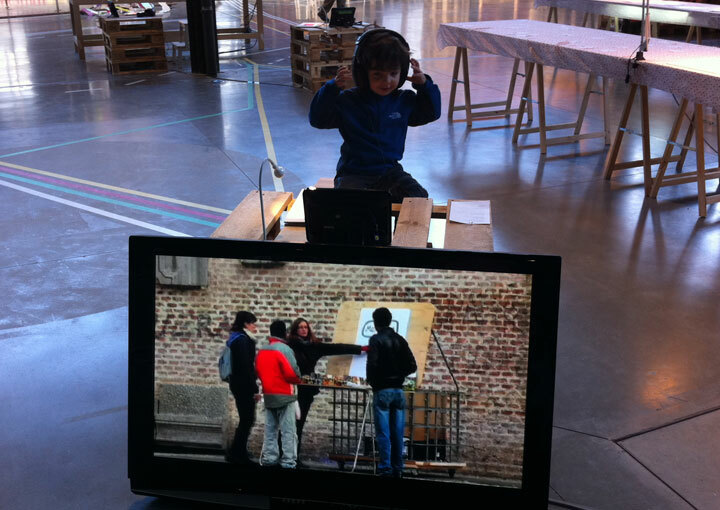 Their mission is to create a public archive of alternative modes of construction. As part of their residency, they constructed the future administrative space in El Ranchito that will be self-sustaining through a bicycle generator located at the top of the office tower. Aesthetically one of my favorite installations or series of works is by the collective Todo para la praxis. Of all the resident artists, this group has been perhaps the busiest at designing and constructing. They have created a series of practical sculptures designed for public use. 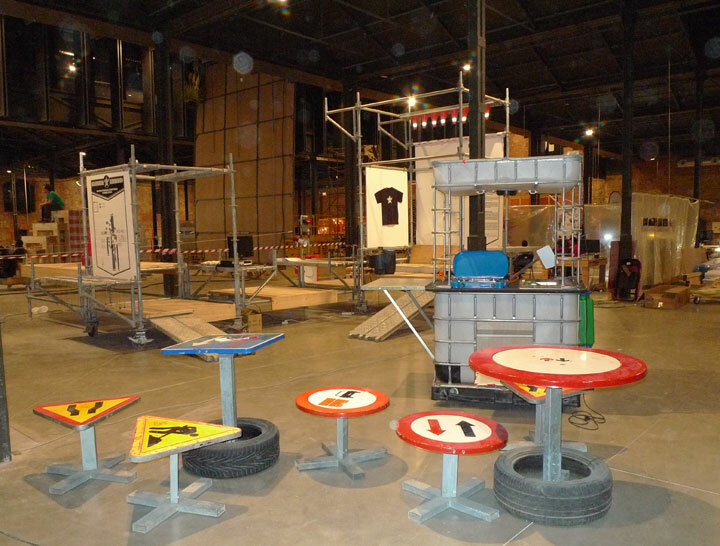 Amongst the constructions are a mobile street kitchen, a dining space, a mobile boom box, an info center. They continue building new things through workshops that they lead. Soon a children’s table and workspace will be introduced. 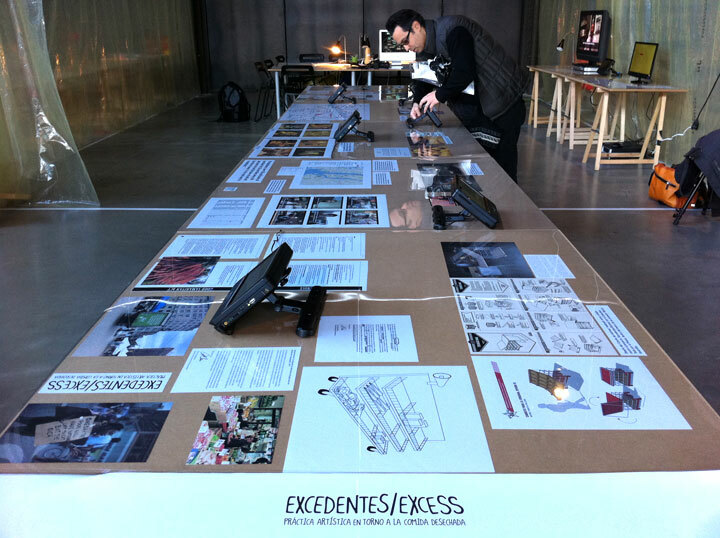 “EXCEDENTES/EXCESS” is a collaborative project between RICARDO MIRANDA Zuniga Y BROOKE SINGER (NUEVA YORK), JOSE LUIS BONGORE, BEATRIZ MARCOS Y SISSA VERDE and was selected as part of the public call for El Ranchito. The project revolves around the large amounts of food going to the dump when there are plenty of people hungry in the cities of New York and Madrid. In NYC the focus has been research and we hope to construct a “composting bicycle” in 2012. 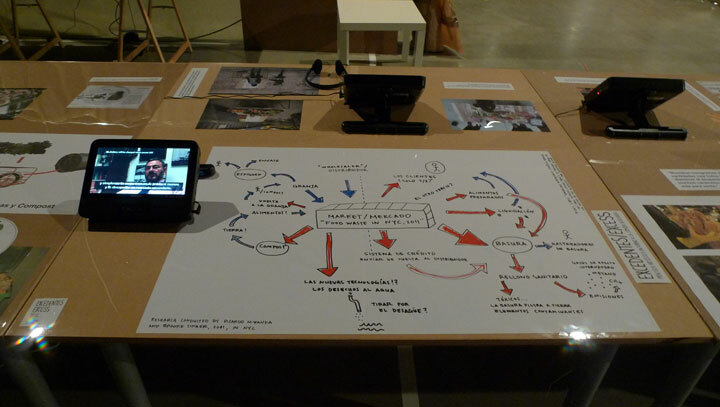 In Madrid, the realization of the food rescue and redistribution cart (pictured last in screen documentation) has lead the Madrid group to researching the possibility of establishing a law that would facilitate the collection and redistribution of discarded food that is safe to consume. A law similar to the Good Samaritan Law in the United States, signed by President Clinton. Research archive for the project "EXCEDENTES/EXCESS"